Visium Resources’ foundation is engineering talent. With over 200 years of combined engineering staffing knowledge on staff, we are the company you can depend on when you need quick, effective solutions. Our success finding exceptional engineering talent has been demonstrated through our numerous high level contracts with successful clients. At Visium, we put your needs first. We have proven the capacity to recruit any position from robotic engineers to cleared talent for our multiple projects with the Department of Defense. Work with the best Engineering Staffing Agency! 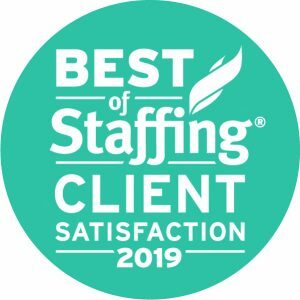 Visium Resources is a proud recipient of the 2019 Best of Staffing Award for Client Satisfaction. Visum was founded on the strength of our ability to acquire the very best engineering talent at competitive rates. With over 200 collective years of experience in the engineering staffing industry, our engineering recruiters have learned exactly where to go and who to network with to identify the best solutions for your needs. At the very core of our service, Visium strives to understand your unique company environment, projects and culture. We take the time to listen and evaluate each of our client’s needs carefully, and do the leg work to confirm that we know exactly what you need. Stop your search now! Talk to one of our Engineering account managers today and find the perfect fit for your position!